The mod Left Hand Rings Modified has been ported correct to SSE with file header 44 and is working well. IF YOU CAN'T SEE YOUR LEFT HAND RING IN THIRD PERSON. So I found a neat little glitch in this mod a while back and figured I would share it. 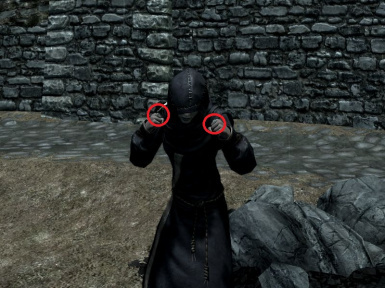 If you are using certain custom races there will be a glitch where the left hand rings will not show up in third person. Also you will be able to equip multiple left handed rings. For instance my Epic elves character is currently wearing 8 left-handed rings and with the standard rings is wearing a total of 9 rings. I haven't tested to see what the actual limit is with this glitch, but I do know each ring must be unique. For example you cant wear 3 gold ring(left) with one-hand enchantments, each ring must either have a different enchant or you must use something like gold ring(left) gold and ruby ring(left) etc. This seems to only work on custom races , but only certain ones. Epic Elves by Zzjay and the Drow Race by Shaggymonster benefit from this glitch, but my Snow elf race and the all the vanilla race work as intended, 2 rings total and visible in third person. This leads me to believe this glitch is a product of the racial mods and not this mod. Keep in mind for those of you who are saying you can't see you left ring in third person, if you are using a custom race this may the reason and your race is affected by this glitch. Rings not showing in 3rd person, and I can equip all rings at the same time, does anyone know what's going on?? Are you using a custom race? I discovered this glitch and use it to make my character kinda OP. I know for sure it happens with Epic Elves by zzjay and the Drow race by Shaggy Monster. However with Vanilla races and my Snow elves race(I forget the author) this mods works as intended. I'm thinking of downloading this but I really just want to be able to wear two rings that I have enchanted or will enchant so do I really need most of the stuff in the requirements? Hey Vinashus, the stuff you are seeing in the "requirements" section are other mods that require this mod, not mods you need to run this, hence the "Mods requiring this file" versus "Nexus Requirements". In short, feel free to download this file and only this file. read the following Guide by Shadowjin." Maybe this is also why I can't see my left hand ring in first person mode. It was too immersion breaking for me, and duel sheathing is far more important to me. So unfortunately, it seems this mod isn't for me... yet. I merged your mod, Left Hand Rings, with Left Hand Enchanted Rings by juf0816, changed the used body slot to 49, and applied Complete Crafting Overhaul compatibility. It seems to be working pretty good so far. Would you mind, after I've finished testing and ensuring USLEEP compatibility, if I shared my minor alterations on Nexus? Providing juf0816 doesn't mind either, of course. I'd put the two of you in there as the authors of course, since all I did was merge, change some lines in TES5Edit and alter the nifs a bit (well, and the CCOR edits). I fully understand if you don't want another version up, of course. I made the alterations purely for me, but figured I'd share. Providing the two of you, as the actual mod authors, don't have any objections. That would be fine, go ahead. 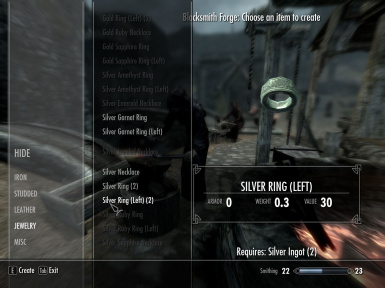 Using a high value unique ring, the Ring of Hircine for example, as the only ingredient to a blacksmithing recipe allows a player to constantly craft the LHR and original versions of the ring back and forth. This gives the player a limitless source of blacksmithing experience for no cost beyond obtaining the ring. 1: Require materials to create a LHR version. Materials that translate to the worth of the resulting ring, a few bars of gold and perhaps some gems, would bring these crafting recipes in line with other blacksmithing recipes for cost-to-gain, and close this loophole. 2: Change the original and LHR rings to a value of 0. As blacksmithing skill is determined by the value of the item made, changing the value of the rings in question to 0 will close this loophole, as no experience will be gained by changing it. 3: Once converted to a LHR version or back again, its value becomes 0. This fix requires 2 extra versions of the original ring: a LHR with a value of zero, and a new RHR with a value of 0. When the player converts the ring to its LHR version, they gain no experience because the ring has no cost. Changing it 'back' to a RHR instead changes it to the new clone of the original that has a value of zero. This fixes the exploit in the same way as solution 2. Has this not been fixed? Bummer. Now that I know about this cheat, I'm reluctant to use the mod. Is this mod compatible with Requiem?